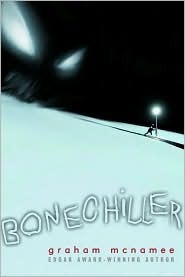 Midnyte Reader: Bonechiller by Graham McNamee. Title/Author: Bonechiller by Graham McNamee. Favorite character: All four of the kids. (Danny, Ash, Howie and Pike). Favorite quote: “Evil takes different shapes…But it’s as real as rain.” Nick (Ash’s father). All in all: A page turner with depth. Synopsis: In this supernatural thriller set in a remote Canadian town in the dead of winter, four friends encounter a cannibalistic creature that is hunting and killing teens. Out late at night, Danny, the narrator, is stung by the terrible monster and it begins to stalk his nightmares. As he becomes increasingly and mysteriously ill, he realizes that his life is in danger. The foursome, after a failed attempt to involve law enforcement, decide to take on the behemoth with stolen dynamite and guns "borrowed" from their fathers. In addition to the main story line, the novel has Danny coming to terms with his mother's recent death and reconnecting with his father. Each of the friends comes across as an individual...The unrelenting pace, short chapters, and the idea of teenagers taking on a monster with a large amount of weaponry will certainly appeal to fans of horror novels. ~Amazon.com. What I didn’t like: !!!! The exclamation marks. I felt there were too many at certain points. Yes very nitpicky of me. What I liked: The characters and the writing. Bonechiller is told via first person by Danny after he moves to a small town in the middle of nowhere because his father is running from the pain of losing his wife to illness. Much of the population is military families and Danny meets his love interest Ash, and brothers Howie and Pike. Danny is a likeable, average kid. He is funny, astute and I sympathize with him, not just because his mother passed away, but by the way he expresses that loss. Danny shows his emotions through memories and by comparing his past life to his present. Ash is his love interest, the girl in the group who is into boxing and has a sassy, take-no-crap attitude, but clearly cares about her friends. Howie is the brain and Pike the “psycho,” but he won me over due to his devotion to his brother. These characters aren’t stereotypes, but multi layered and reveal themselves and their best qualities as the story progresses. I also liked Danny’s father, the fragile widower and I enjoyed the easy going teasing between them. There is sadness in their home and I feel that if they connected with each other more, they would be able to get past some of their grief. It seems that Danny won't show his own hurt in order to spare his father further pain. I thought it was cute how Danny messes with his dad when it comes to an interested female in the neighborhood and tries to push them together in small ways. So, even though Danny's father was a peripheral character there is a lot of depth to him and in his and Danny's relationship. Nick, Ash’s father is another great character. He is a tough as nails Native American in the military and Ash’s boxing coach. He and Ash have a great relationship and he also cares about Danny. It was refreshing to see children and parents getting along, not always at odds and loving each other. Danny and Howie get “marked” by a monster who is haunting their dreams and causing them to physically change. The book isn't over the top terrifying or gory but it is thrilling and frightening as they first deal with these changes and then find out what the fate is of others who have gone through this. They enlist their friends to help them and together they come up with a dangerous plan to kill the beast. The setting of Harvest Cove in northern Canada, the winter climate and bleak setting is a character in itself. The harsh conditions cause hardship and contribute to the way of life in the town. The isolated location serves to bring the friends much closer together. Danny has to make a choice. He could run far away from the threat or stay and fight. He ultimately decides to stay because he feels he got left behind by his mother and he doesn’t want to leave Howie behind. He also wants to stay because he finally made friends and he wants to see where his relationship with Ash may lead. He is tired of moving around and wants to stay in one spot. He realizes that you can’t outrun memories but maybe you can make new ones. Midnighte, I'm so guilty of overusing exclamation marks. I don't think I even notice it anymore. LOL! I hadn't heard of this book before, but I love me some good character development and illustration in stories, so I'm definitely going to add this one to my wish list. I love that kissing lightning comment. WOW! Great review. I'm so intrigued by the mystery of it all. This book was a quick read because it was so good, I didn't want to put it down. The descriptions are great and there is suspense building from page one.